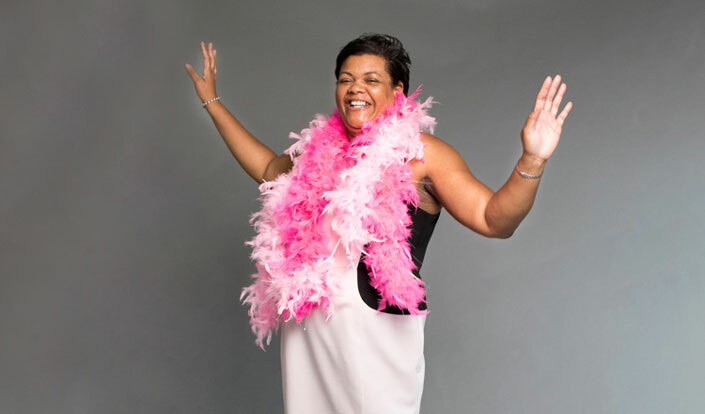 Brenda has been fundraising for Breast Cancer Now for four years. She tells us what she has learnt from previous events and her daredevil ideas for this year’s wear it pink. I got involved with Breast Cancer Now after my sister died of breast cancer. I was approached by a focus group during the merger of Breast Cancer Campaign and Breakthrough Breast Cancer, which would eventually become Breast Cancer Now. It was important to show my support not just for my sister, but to everyone who has or knows someone who is impacted by this disease. I also wanted to show that we are united together in finding a cure by raising funds to support the research it takes. The focus group showed me that this charity do not treat people as a number and that they really are engaged with their supporters, fundraisers and campaigners. That’s when I decided to join wear it pink. Being part of this event for so many years has showed me how dedicated Breast Cancer Now is. They are like a second family to me now and I do honestly love them all. My first fundraising event was a bake sale and a small raffle. The following year I was so excited I wanted to double the money I raised. To fundraise for so many years you really need to build an army around you – I have learned that the more you get involved the more people you need to help with the jobs. Over the years I have contacted all my friends and family in different industries and asked if they were willing to donate any prizes, big or small and explained where the money was going to. I had an advantage as the area I work in I also grew up in so everyone knew me and knows how passionate I am about raising funds for Breast Cancer Now, so the prizes just kept coming in. Taking part in wear it pink has also inspired me to get involved in other charity events within my area, like the Santa Run in December with my family. My granddaughter was only 20 months old when she achieved her first walk and second medal for charity. For wear it pink 2017, I decided to raise money by conquering my fears. For example, I always wanted a tattoo but been too scared, so if I raised £400 I would get a tattoo of a pink ribbon. I would love to ride a motorbike, so that’s another one on the list. I’ve achieved so much through my fundraising throughout the years, and I’m so proud to be on the front line for this year. I’m wearing pink for all the sisters that are missed. Joining us for wear it pink 2018? Take a look at our ideas, tips and downloadable resources to help you plan the perfect pink day.